1) Each person participates in Chasopoly in an individual capacity. 2) The values are based on Company Rand earned (ie A sale where we receive of R100 000 commission after vat that is shared between two agents equally gives each agent R25 000 and each agent R25 000 Company Rand. 7) Travel Vouchers are not accumulative – the Voucher is based on the highest achieved in the qualifying period. After the R12 000 Travel Voucher has been earned on side three for each of every ten blocks (moves) a proportional credit towards the Funvention can be earned. (a) If the cost of the Funvention is R45 000 and the agent gets to the last block (called LONDON) before qualifying for the Funvention they would get (a) R12 000 for completing side three plus R29 700 ie a total of R41 700 paying in the difference of R3 300. (b) If the agent got to the second last block (called DURBAN) before qualifying they would get (a) R12 000 for completing side three plus R26 400 ie a total of R38 400 paying in the difference of R6 600. (c) If the agent got to the second last block (called CAPE TOWN) before qualifying they would get (a) R12 000 for completing side three plus R23 100 ie a total of R35 100 paying in the difference of R9 900. 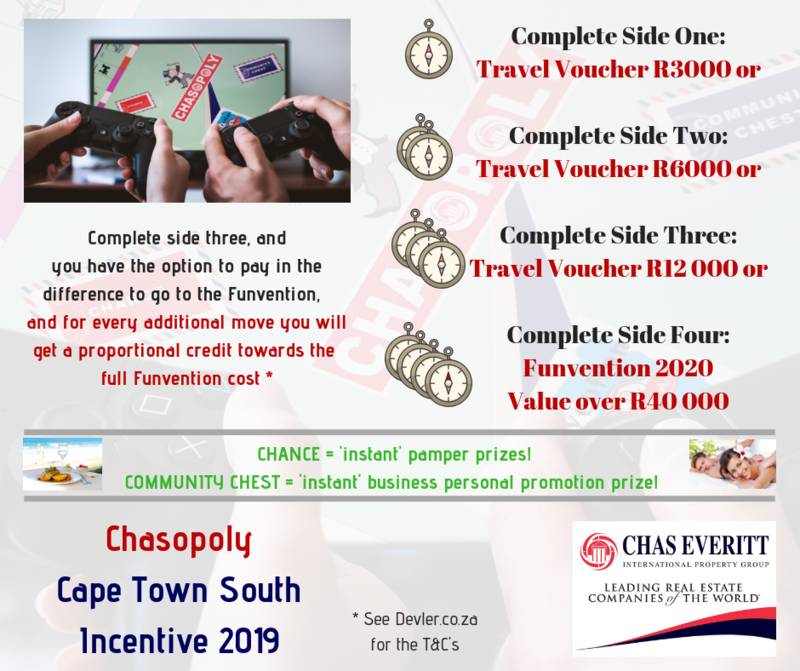 12) Chasopoly replaces Elevate and all our incentives with effect from the 1st January 2019. Elevate and any other incentive that may be applicable comes to an end at the end of December 2018.